How much does it cost to travel to Plitvice Lakes National Park? How much money will you need in Plitvice Lakes National Park? The average price of food for one day is kn25 ($3.70). Additional pricing is in the table below. These average travel prices have been collected from other travelers to help you plan your own travel budget. 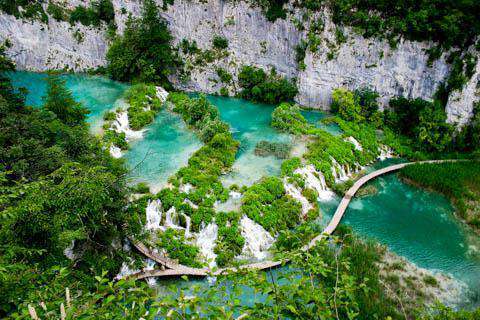 How expensive is Plitvice Lakes National Park? One of the most beautiful natural sights in Europe, Plitvice Lakes National Park is an area of green forests laced with a system of interconnected turquoise lakes. It was set aside as a national park in 1949, and was later designated an UNESCO World Heritage Site in 1979. The natural sights at Plitvice National Park surpass the norm. With sixteen beautiful lakes flowing one into the next in graceful cascades and plummeting falls, its magnificence is undeniable. The lakes themselves emit a turquoise color like gems of the earth, while the falls run over limestone canyons draped thickly in green forest. The sixteen lakes are separated into an upper and lower cluster formed by runoff from the mountains, descending from an altitude of 636 meters to 503 meters over a distance of some eight kilometers. The waters then exit from the lowest lake to form the Korana River. The forested areas of the park consist mainly of beech, spruce, and fir trees, as well as a mixture of Alpine and Mediterranean vegetation. It is home to a diverse array of animal and bird species like the European brown bear, wolf, eagle, owl, lynx, wild cat, and capercaillie amongst others. Fish, frogs, and many bird species also inhabit the lakes. As far as special attractions go, one of the most visited areas is the Veliki Slap, a 78-meter waterfall surrounded by nearby boulders to which visitors have access. In the surrounding rock face there is also a cave that leads to another large waterfall complex. The nearest cities, from where many people take day trip to the lakes, are Zadar and Zagreb. If you plan on spending more than the day, however, there are a variety of options closer to the park itself. Several large hotels are situated near the entrance to Plitvice, however, if you are looking for less expensive accommodations there are other choices available. A travel agent at the park entrance can help you find a homestay where locals will rent out their homes and provide food during your stay, or you can ask around and see if you can find a room at a lower cost in a local apartment. There is also a campground in the nearby town of Korana (8 km away), which many park visitors enjoy. Facilities include clean toilets, a small shop, a couple of dining places, as well as bungalows available for rent. The campground also arranges buses to and from the park in the main season. The town of Borje also has a campground, though it is 16 km away and has no bus service to and from the park. Within the park the biggest activities are hiking and walking to admire the natural wonders of the lakes and surrounding area. There are a few trails that can be easily hiked in a day with planked walkways winding amongst the cascades and waterways. Be aware that swimming is not permitted anywhere in the park. In Croatian cuisine, types of dishes will vary with more seafood available closer to the coast and a different variety inland. Since Plitvice is more continental, some meals you might come across include stuffed peppers with mincemeat, rice, and mashed potatoes, a type of filled dough pastry called strukli, a hearty meat stew called cobanac, turkey with mlinci (flatbread pieces soaked in roasting juices), a spicy fish stew called fish paprika, and sarma or cabbage rolls filled with meat. There is also a long Croatian tradition of making salami, so be sure to try some while you are there. Within the park itself, there are some snack shops at the entrance and exit, as well as a large picnic area with a few food stands which can be reached by ferry across the main lake. Beyond this, many restaurants can be found along the road to and from Plitvice. The best way to get to Plitvice is from the nearby cities of Zadar, Zagreb, and Split. Zadar Airport is the closest to Plitvice at about 130 kilometers away. From here, the best method of travel is to take a connecting bus to Zadar Bus Station, then another bus from here to Plitvice. The journey takes about 2 hours. Zagreb Airport is another good point from which to reach Plitvice at about 140 kilometers away. From the airport, travelers can take a connecting bus to the main bus station in Zagreb, and then from here take one of the numerous buses to the Plitvice Lakes. The journey takes about 2 hours and 20 minutes. From Split, there are direct buses connecting Split and the Plitvice Lakes, however, the journey is too long to make it there and back in one day (taking nearly 6 hours). A ticket is required to enter the park, which you can acquire at the park offices upon arrival. With the ticket, visitors are offered free travel on the boats which run on the lakes.